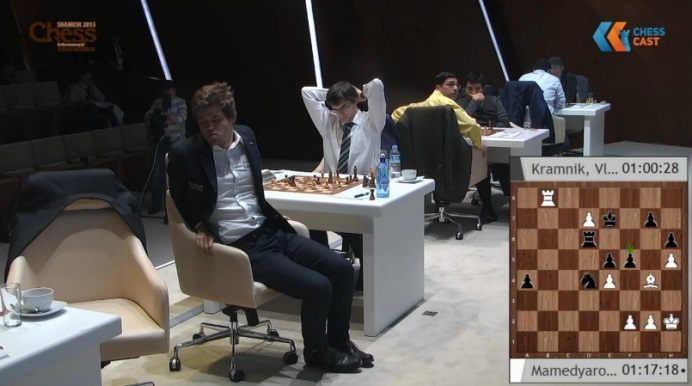 Magnus Carlsen took an 11-minute think on move 2 on his way to a sparkling win over Maxime Vachier-Lagrave. 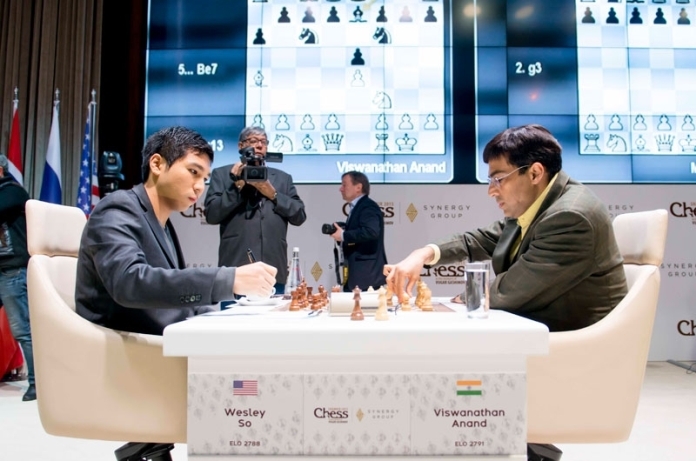 That took the Norwegian into the Shamkir Chess lead after Wesley So was on the wrong end of a Vishy Anand masterpiece in his first game against the former World Champion. Another former Champion, Vladimir Kramnik, lost after six hours of torture from Shakhriyar Mamedyarov, while Anish Giri escaped from the clutches of Fabiano Caruana. What a day! 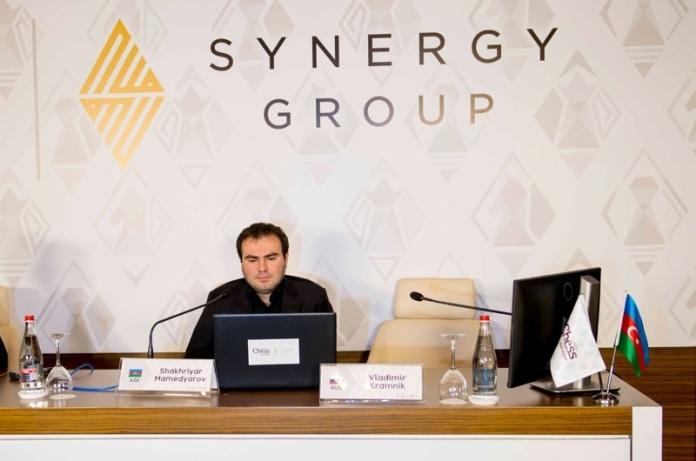 Just when it had seemed Wesley So might run away with the Gashimov Memorial in Shamkir he instead ran into some brilliant preparation from Vishy Anand, who said he’d been shown the idea by his second the day before. 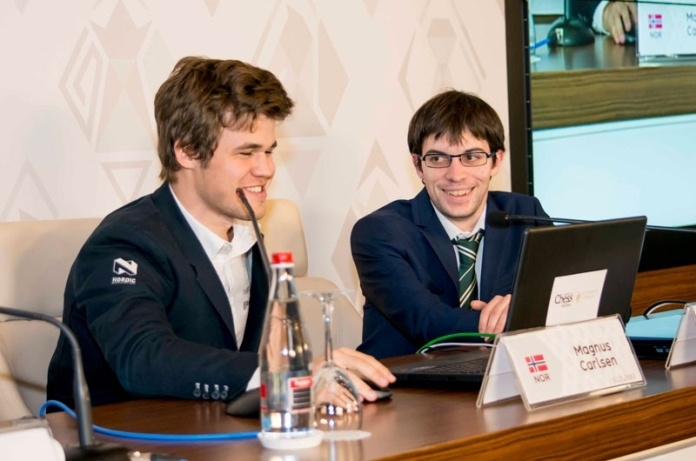 After Carlsen beat Anand in two World Championship matches there were some people who thought that facing Vishy was a walk in the park - that it didn't mean much to beat him and that avoiding his theoretical preparation was almost trivial. Well, games like this make you realise just how impressive Magnus' feat really was. I suspect So returned to his room this evening thinking, "wow, this guy is tough!" 1. e4 e5 2. ♘f3 ♘c6 3. ♗b5 a6 4. ♗a4 ♘f6 5. O-O ♗e7 6. d3 I could explain various things about the Ruy Lopez, but since there's a 3-hour video series about this by Peter Svidler (of whom more later in this report) what could I possibly add? 6... b5 7. ♗b3 O-O 8. ♘c3 d6 9. a3 ♘b8 Wesley used this move to surprise all and sundry in the Tata Steel tournament at the start of the year, drawing easily against Caruana. 10... ♘c6 So decides to return the knight since he sees Anand is going to launch an attack on the kingside. His idea is to place it on d4, where apart from having a good outpost it will also help support a move like Be6. As we'll see in the game, it's normal that Vishy plays Ne2 in order to eliminate the knight, meaning So manages to exchange off a pair of pieces... That's the kind of small mercy to be grateful for when a heavy attack is looming! a) 15. ♘xd5 is also possible, and after 15... ♘xd4 16. ♘xe7+ ♕xe7 17. ♗xf7+ Black has to choose between 17... ♖xf7 or (17... ♔h8 ) 18. gxf7+ ♔f8 and in both cases the position remains incredibly confusing. b1) 16... ♗xf5 17. exf5 ♘h6 (17... ♘f6 18. ♘xd5 followed by Nxf6 and Qh5.) 18. ♕h5 Threatening Qg6 and capturing on h6. b2) 16... ♘h6 17. ♗xh6 gxh6 18. ♗xd5 and although White has three pawns for the piece and you can't exactly say the black king is safe, the machine thinks Black is doing well... Is it right? Perhaps! Would Anand have gone for this line? It's hard to say. Perhaps if So had responded quickly (a sign he'd analysed it) then he would have chosen 15. Nxd5, but if So was thinking over the board Anand might have chosen this, knowing that Black has to resolve difficult practical problems... In any case, it would have been a riot! 11. ♗a2 Anticipating the arrival of the knight on d4. 11... h6 12. f4 would again be absolute chaos. The fact that the black knight is already on c6 might favour Black, although as we've seen, in some lines the bishop comes to d5, so once again nothing is clear! 12. ♘e2 ♘xe2+ 13. ♕xe2 h6 Finally So decides to take the bull by the horns! 14... exf4 could once again be met calmly with 15. ♘f3 and although the engine shows 15... g5 with an edge for Black, this time I don't believe it! White can prepare to break open the black kingside and I know which side I'd rather be on. 15... ♗g4 is another way to stop the queen coming to h5, but after 16. ♕f2 ♘h7 17. g6 ♘f6 18. ♗g5! the queen will end up entering on h4, with similar effect. 16... ♘h6 which, frankly, looks horrible! But once again, the machines (and in such positions there's not much room for human opinion) find a defence from another planet. 17. ♗xh6 gxh6 18. ♖xf7 ♖xf7 19. ♖f1 Black's going to get mated in a few moves, isn't he? Just watch how Stockfish defends - with only moves. (19. ♕f2 ♗f6 20. gxf7+ ♔f8 21. ♖f1 ♗g7 seems to hold things together.) 19... ♔g7! 20. ♖xf7+ ♔xg6! 21. ♕f3 h5‼ Threatening Bg4, since it frees up the h6-square for the king. It's curious to note that after 22. h3 Stockfish demostrates a great sense of humour by proposing 22... h4 , preventing Qg3, and White has nothing better than to take a perpetual check. What a defence! 17. h3 A way has to be found to get the queen to h5. 19. ♕h5 Threatening Bxf7, so once again Black has an only move. 19... ♗e6 20. ♗xe6 fxe6 Is the worst over? 21. g4 Pouring more fuel on the fire! There's no way to prevent g5, so White regains the piece. 22. g5 immediately would have been more effective since, as we'll see, the move in the game gives So a chance to put up tough resistance. 22... ♕xf8 23. ♖f1 ♕e7 24. g5 ♖f8 So manages to simplify so that his king need no longer suffer, but the ensuing ending is very tough. 25. gxh6 ♖xf1+ 26. ♔xf1 ♕f8+ 27. ♔e2 Vishy felt it was crucial that the king makes it over onto the queenside, above all in order to avoid perpetual checks, but also to have a chance to invade on the dark squares. 27... gxh6 28. ♕g4! ♕f6 29. h4! The h-pawn shores up its colleague on g6. Although there's material equality on the board Black can barely move. Nevertheless, the move So chooses makes White's task easier. 29... a5 with the idea of following up 30. b4 with 30... a4 would greatly have complicated White's task. 31. h5 c5! The key to Black's defence. The idea is that if the white queen tries to enter on the queenside the black queen will be in time to take on h5 and g6. The ending would still be very complicated after a move like 32. c4! leading to an extremely exciting position where I was unable to find a way for White to win. It's worth taking a look at some of the lines, since they're totally surreal! 32... cxb4 33. cxb5 b3 34. b6 b2 35. ♕g1 Black's b-pawn is stopped so the White b-pawn will decide matters... or will it? 35... ♕g5! 36. b7! ♕xh5+ (36... ♕xg1 is impossible due to 37. b8Q+ ♔g7 38. ♕c7+ ♔f6 39. ♕d8+ and Black gets mated.) 37. ♔d2 ♕h2+! What a resource! 38. ♕xh2 b1Q 39. ♕xh6 ♕b2+! An essential nuance. (39... ♕xb7 can't be played since the pawn ending is lost. 40. ♕h7+ ♕xh7 41. gxh7+ ♔xh7 42. ♔c3 ) 40. ♔e3 (40. ♔d1 ♕xb7 is now possible since the white king is badly placed for the pawn ending.) 40... ♕c1+! (40... ♕xb7 would in this case be met by 41. g7 ♕xg7 42. ♕xe6+ and the ending should be lost.) 41. ♔e2 ♕xh6 42. b8Q+ ♔g7 43. ♕xd6 The position seems almost lost for Black but the machine finds a brilliant defence: 43... ♕h2+ 44. ♔d1 ♕b2! 45. ♕d7+ ♔h6! 46. ♕xa4 ♕b1+ And Black manages to trap the white king. Not bad, right? 30. h5 d4 31. b4! Now it's easy for White. 31... ♔g7 32. ♕f3 ♕e7 33. ♔d1 ♔g8 34. ♕f2 ♔g7 35. c3! dxc3 36. ♔c2 ♕c7 37. ♕c5 ♔g8 38. ♕e3 a5 39. ♕h3 axb4 40. ♕xe6+ ♔f8 41. axb4 ♕a7 42. ♔xc3 ♕a3+ 43. ♔c2 ♕a4+ 44. ♕b3 ♕a7 45. d4 A pretty final break in order to allow the white king to come to d3. So resigned. 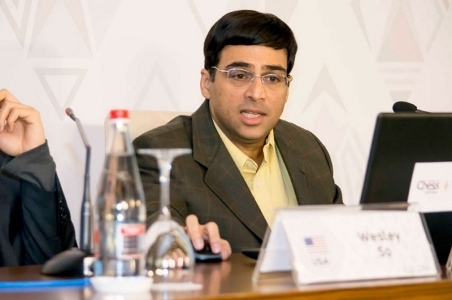 A magnificent attacking game by Vishy Anand, who showed off some of his greatest strengths: deep and original preparation and great precision in dynamic play. A masterpiece! Vishy played really well today and completely outplayed me. It doesn’t really matter who you’re playing… my opponent made lots of accurate moves today and it’s an uncomfortable position. Today was a very nice win against the tournament leader, who’s just been dominating. That game suddenly made it possible for Magnus Carlsen to take the lead, and it was the kind of chance he doesn’t often turn down. 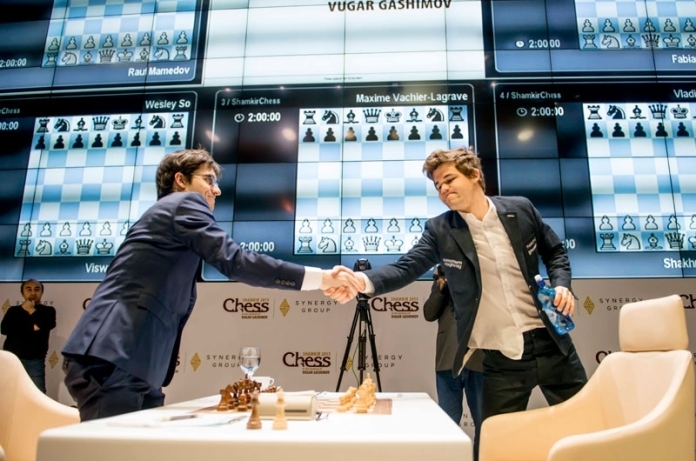 Carlsen 1-0 Vachier-Lagrave: May you live in interesting times! 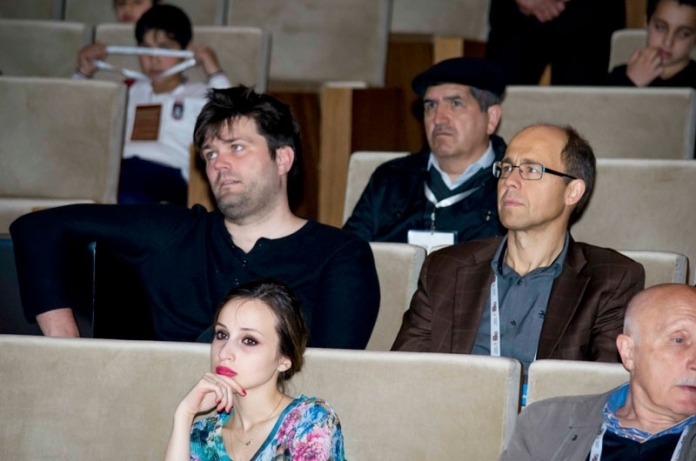 Maxime Vachier-Lagrave had gone on record as regretting being unable to play any interesting chess in Shamkir so far since he kept playing or walking into heavy theoretical lines. Well, at least that all changed in Round 5! The move that stopped all the fun, for one of the players, was 14.Bg5! I took a lot of time to understand what was the point and then I understood it wasn’t going to be easy today. At first maybe I was confused but it’s clear that Magnus played extremely well today. This idea is maybe not terribly difficult to see, but it doesn’t really come obviously to the mind. Some of the moves… as usual with Carlsen it always looks very easy when it’s played, but it’s not so easy to notice. To play interesting chess and also to win on one day - you can’t have it better than that! It gives more of a feeling of harmony during the game - I think for many chess players harmony is very important. We’re getting to witness an artist at work. The last time these players met for a classical game it was a gut-wrenching encounter for Shakhriyar Mamedyarov. 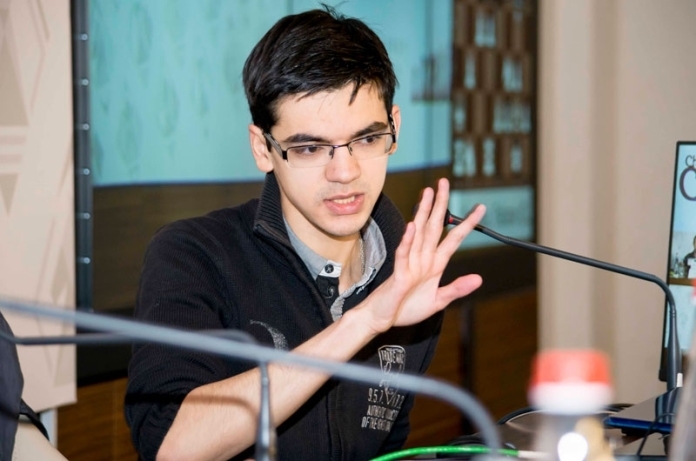 He’d won two of his last three games in the 2014 Candidates Tournament in Khanty-Mansiysk, and after a middlegame where Kramnik was on top he seized the initiative and was close to winning – only to throw away the win with a move made in 8 seconds in no time trouble and follow it up by a second that condemned him to certain defeat. That game was on Shakhriyar’s mind today when he was asked about Vladimir failing to appear for the post-game press conference. Although Mamedyarov could understand it, and his opponent was a World Champion, he pointed out he'd faced the press back then. Kramnik spent under a minute choosing 31…axb6? !, when after 32.Qb3! Be6 (the threat was mate-in-1) 33.Qxe6 Qxe6 34.Bxe6 Mamedyarov had won a pawn, which he eventually managed to convert into a win after another 40 or so moves. The computers claim 31…Qxd6 is equal here, though it’s easy to see why Kramnik would fear the plan Mamedyarov pointed out in the post-game press conference: 32.Na4 Ra5 33.Rc1!, exploiting the fact that 31…Rxa4? runs into 32.Qb3! (again that mate-in-one threat). It would have been very tough to stay afloat in time trouble, though Kramnik might have preferred a quick death to what befell him! 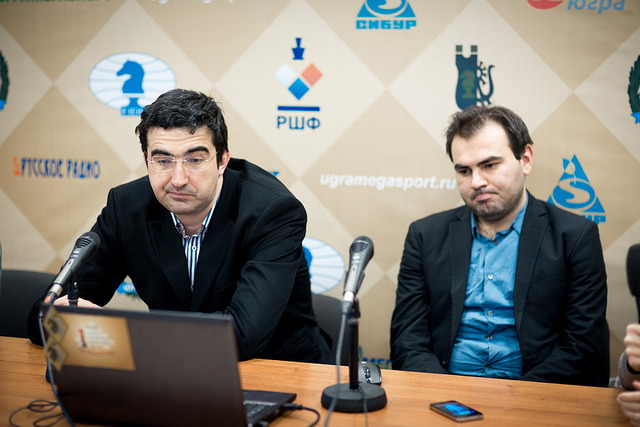 Watch the post-game press conference, which Mamedyarov was kind enough to conduct almost entirely in English! That only leaves the two draws, one of which, the 50-move encounter between strugglers Rauf Mamedov and Michael Adams, can safely be passed over in silence. It was a hard-fought but balanced encounter, with the most interesting moment perhaps coming afterwards when Mamedov said he’d always been a great fan of Michael’s and would have been rooting for him if he wasn’t playing. I decided I’m probably lost and I left it to Caruana to find out how. There was no transitional phase. White was winning and then it was already equal. In fact relief at surviving was soon replaced by euphoria, since Giri thought he was going to go on and win, but although Caruana was annoyed at letting a “clean win” slip from his grasp he buckled down and held the draw. I have some nice opponents, some “clients” of mine to come, so I’m feeling optimistic! I’m just wondering who he’s going to kick tomorrow. With Magnus it doesn’t matter!